Anna Baumgarten & Laura Holliday at DIF HQ. Disfluency. There is so much to say about this short film. From writer/producer Anna Baumgarten and director Laura Holliday, Disfluency tackles sexual assault and the aftermath with the perfect mix of realism, understanding, and maturity. But the filmmaking here is so good that I jumped on a soapbox at Film Invasion Los Angeles and insisted that the Q&A focus on how well written and directed this film is. By the way, at FILA 2018 it won the Filmmakers Award for Outstanding Short Film as well as Best Director for Laura Holliday. And as you can see by all the laurels on the video below, Disfluency received accolades throughout its festival run. 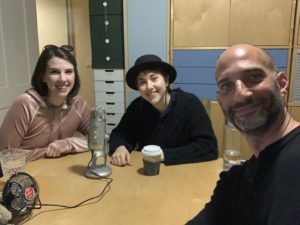 We had a great Q&A with Anna and Laura at FILA; I think I may have mentioned the podcast to them back then. Maybe I didn’t, but it’s a good story. This is a loooong interview. After all, we had two filmmaker’s histories to cover. But don’t worry, it’s also a fun interview. Laura and Anna started in sketch comedy and their ability to play off of each other shows throughout the interview. But… SPOILER ALTER. WATCH THE FILM FIRST. Disfluency is superb in every way. You really just need to watch it. So do that right now!